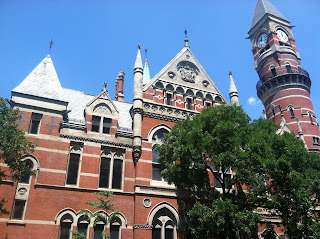 Housed in one of New York City’s “most remarkable buildings” and what my children once called Hogwarts, perched in glorious Gothic details, with its clock and tower, is the Jefferson Market Library. And inside this magnificent building is the children’s resource room, tended over by Rebecca Schosha. 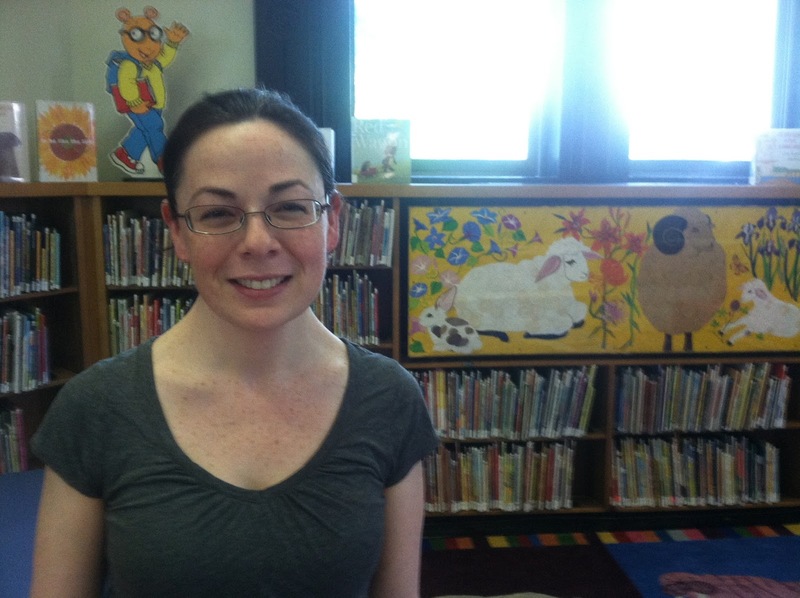 Rebecca has worked in the children’s room for over five years and been a librarian for fourteen years. She began her adventure as a page in high school. She even went to Librarian School. How cool is that? 1. I know this is a very active branch of the NYPL. How many schools use this Resource Room? This branch serves about five elementary schools and many preschools. Technically, children from birth to twelve, but all ages use the Children’s Resource Room. Many of the books cross over to teens—and adults. 2. What genres do you find middle graders drawn to? Fantasy is huge. Comics and realistic fiction and, if there’s a really good historical fiction out --and people know about it-- kids will want to read that too, like Laurie Halse Anderson’s series, Chains. Historical fiction is not a genre kids are actively seeking out but, if it’s really good, I’ll recommend it and they’ll love it. It’s also my favorite. They love realistic fiction: Wimpy Kid, Judy Bloom, Beverly Cleary, and Lauren Myracle. 3. What do you wish you saw more of on the shelves? Oh, that’s a good question. I guess in my dream world, there’d be more books like Wonder. In the past years the three books that have come out that I recommend to any middle grader and they will love are: Holes by Louis Sachar, When You Reach Me by Rebecca Stead, and Wonder by R.J. Palacio. When books like these come along, they’re like little miracles. Finding books that grab you by the heart. 4. And what are some of your top book recommendations for fifth--sixth graders? Someone to watch, that I just love and historical fiction, is Kristin Levine and her book Lions Of Little Rock takes place in Arkansas during the Civil Rights Movement. Every time I recommend this, it’s a hit. It’s a little bit of a mystery, about friendship, and it’s beautifully written. It has a lot of heart. She also wrote a book called The Best Bad Luck I Ever Had and it’s wonderful. Also, for fifth graders, but six and seventh graders are reading it too, is The Cavendish Home For Boys And Girls by Claire Legrand. And it’s horrifying. It’s scary. It disturbed them but they really liked it. Also, The Water Castle by Megan Frazer Blakemore. I like this a lot because it combines fantasy and history. I feel like we’re moving away from vampires and into zombies and series Dead City by James Ponte has been a big hit. I could not put it down. Because Of Mr. Terupt by Rob Buyea. It makes you think, and I think it has a lot of heart. It’s really well done. Same Sun Here by Silas House and Neela Vaswani. It’s a correspondence between a girl in NYC’s Chinatown and a boy in rural Appalachia and both are going through major upheaval in their lives and they’re pen pals. 5. What books would you recommend for a reluctant reader? Two series: I Survived Series Lauren Tarshis. There’s a whole host of them, and boys, in particular, are really drawn to them. They’re realistic and fun. The Worst Case Scenario books, where you choose your own adventure. I can’t keep them on the shelves. The presentation is really put together. 6. Are you seeing many e-readers? Not really. I'm not a big fan of them for children but any way I can get kids to read and love books is good. And the more ways you can read—the more you will read. You can enlarge the print which may help some. 7. You have many books compiled here. What are a few others you’d like to recommend for middle graders? Brain Selznick. When you give someone a Brian Selznick book, you are giving him/her a work of art. Your giving them something that’s beautifully written, they’ll enjoy, and can get through. You can’t loose. Big in the Comics is George O’Conner’s Olympians. Another graphic novel that appeals more to girls: Smile by Raina Telgemeier and Drama. Also HUGE, are the Who Was biographies. Kids LOVE these books, all featuring different authors. These books fly off the shelves. And Kathleen Krull's biography series, Giants Of Science, is all about scientists. She knows how to zero in on the humorous quirks about people. They read like butter and children love them. They're great for strong readers from fifth--seventh grade. 8. When you’re not helping children explore the universe, what else do you do for fun? I read, hang out with friends, and play with my dog, Chloe, a terrier mix. Thank you so much for this interview Rebecca. It was such a pleasure hearing your enthusiasm for these wonderful books and quite infectious. 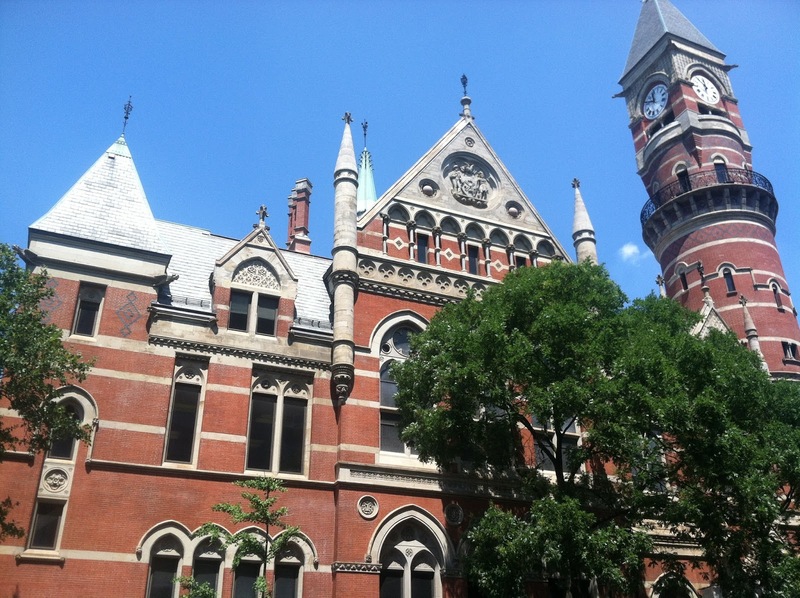 So, readers, if you want to head into the pillars of wisdom at the Jefferson Market Library, know that the passionate and knowledgeable librarian, Rebecca Shosha, is ready to guide your way. And coming soon--her very own blog--with even more book recs! Fascinating interview! So instead of having school libraries, the schools have the kids go to the public library resource room? What a great way to introduce kids to the public library! I love hearing what kids enjoy reading the most, too. Thanks for the visit F.T. Bradley. And thanks for sharing. What a great interview! Rebecca seems like such a gem, steering kids towards the "right" books that they will enjoy. Librarians in my community aren't as helpful, basically helping children find a book on the shelf rather than providing them with recommendations. There are some great book suggestions in this post which I'm adding to my TBR pile right now. Thanks for a great interview! You are the second librarian to recommend The Best Bad Luck I've Ever Had. Must look into it!